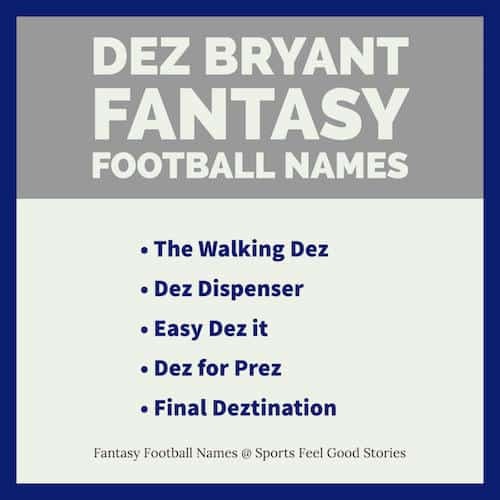 These Dez Bryant Fantasy Football team names are a great resource if you land the Dallas Cowboys receiver on your team. Bryant, a Texas native, was an All-American at Oklahoma State in college. In high school, Bryant competed in track and field and was a strong performer in hurdles and the triple jump. Bryant has been named a Pro Bowler three times in his career. Where did Dez play college football? What number does Dez Bryant wear for the Dallas Cowboys? What is the name of Dez Bryant’s personal brand and apparel name? What merchandise sales record did Dez set in 2015? Answer: His merchandise sold more than any other wide receiver that year. If you have any suggestions, please let us know via the contact page. Thanks.